The Cannes Film Festival may be all about film, but just as important are the fashions that walk the red carpet. And even more important is how these fashions seemingly resemble food of the sweet persuasion. 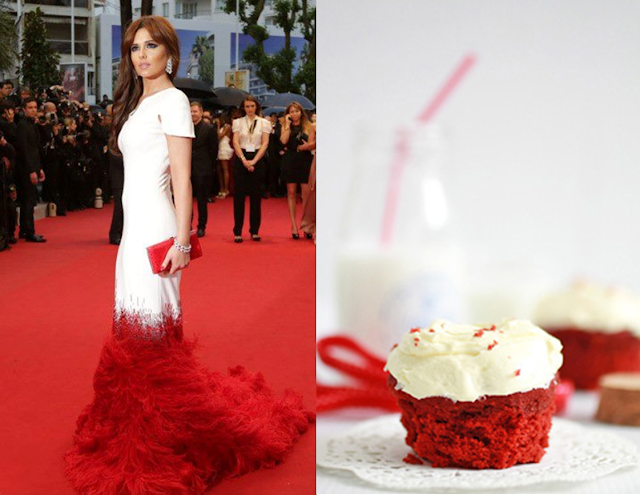 Here we have Cheryl Cole wearing a jaw-dropping Stephane Rowland Spring 2012 couture gown and right beside it, a red velvet cupcake. The resemblance is uncanny. I am all for clothing that looks good enough to eat. In fact, I think the future of fashion lies in edible clothing (not the raunchy kind). If it's good enough to eat, it's good enough to wear. I would also like to point out another amazing facet of this ensemble is that the train gets lost in the red carpet so you never know where her dress ends. Genius.